Most used blockchains right now. 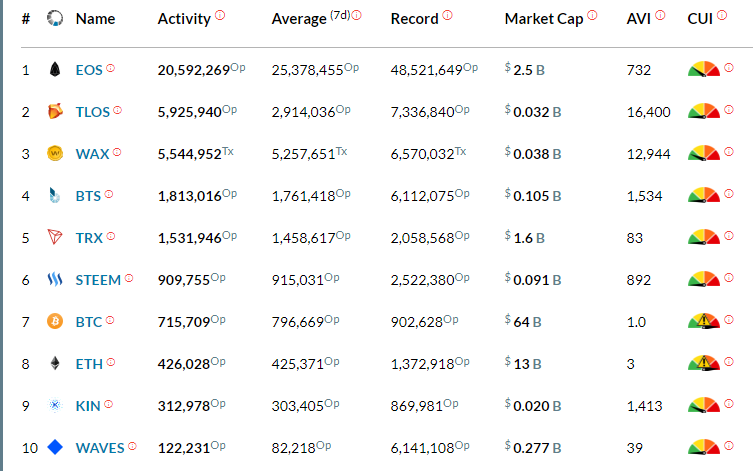 EOS, BTS and STEEM made by Dan all in top10. TLOS is a fork so we can still say its same tech. Looks like graphene is best tech for blockchains that are used. Yesterday I read a report that 93% of ETH dapps are dead at this point, this bear market has been hell and only the strong survive I guess. So we are on number sixth now.☺️☺️Not bad.!! WAX is an EOS clone as well. I remember those days when Steem had the number one position for almost 3 months, I don't know what happened and what will take us back to the top?? Do you think that these transactions could be made by bots. Like why has eos got that many tx what apps run on it? Operations are free on EOS, no? It's also used for dapps which take up a lot of operations. Probably quite a lot are made by automated processes, but that doesn't discredit their quantity. @kingscrown, Yes, this stuff is great to explore and i really want to see Steem once again on first place but to be in top 10 is nothing less for sure. Live SMT model can push Steem Blockchain ahead for sure. Stay blessed. Your UA account score is currently 7.272 which ranks you at #66 across all Steem accounts.